This is it. The Ferrari 458 Italia, the 562 HP replacement for the F430 and the latest prancing pony to make you ache with automotive lust. The F430 was nice and all, but it was beginning to feel hacked together with so many iterations since the body's first inception. This latest piece is quite the machine, unified in design and packing a cracking engine, a 4.5-liter, direct injection V8 with 562 HP, 398 lb-ft of torque at 6,000 RPM with 80% torque coming in at 3,250 RPM. That's 52 HP more than the standard F430. Zero to sixty is expected to come in at less than 3.4 seconds and top speed will be over 200 MPH. But it's not all beauty and speed, there are some pretty neat tricks too. Like those winglets in the grille? Those are actually passively variable aerodynamic elements, as speed increases, they deform downward and increase downforce — how cool is that! And don't even get us started on the tailpipes. That triple-exhaust looks hot! Press release and all the technical details straight from Ferrari's lips can be found in the gallery below. Maranello, July 28th 2009 – While it's true that every Ferrari is innovative by definition, it's equally true that in the course of the Prancing Horse's history, certain cars have marked a genuine departure from the current range. This is very much the case with the Ferrari 458 Italia, which is a massive leap forward from the company's previous mid-rear engined sports cars. The Ferrari 458 Italia's Pininfarina design provides further evidence of the complete departure from the past that this new car hails. The Ferrari 458 Italia has a compact, aerodynamic shape, underscoring the concepts of simplicity, efficiency and lightness that inspired the project. As with every Ferrari, the car's styling has been very heavily influenced by the requirements for aerodynamic efficiency, as can be seen from the downforce of 140 kg at 200km/h generated by the new model. The front features a single opening for the front grille and side air intakes, with aerodynamic sections and profiles designed to direct air to the coolant radiators and the new flat underbody. The nose also sports small aeroelastic winglets which generate downforce and, as speed rises, deform to reduce the section of the radiator inlets and cut drag. The car's soundtrack is also typical Ferrari, with an exciting, powerful growl emerging from the engine before it channels through to the exhaust's three rear tailpipes. The engineers also focused on weight reduction during the design phase for similar reasons. 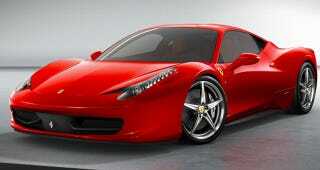 Consequently, the Ferrari 458 Italia has a dry weight of 1380 kg with a power-to-weight ratio of 2.42 kg/CV. Weight distribution is also optimal with 58 per cent over the rear axle. The result of the engineers' endeavours can be summed up in to two simple statistics which together perfectly encapsulate the Ferrari 458 Italia's exceptional performance: 0-100 km/h acceleration in under 3.4 seconds and a maximum speed in excess of 325 km/h. For the new chassis, once more in aluminium, Maranello's engineers incorporated various types of advanced alloys along with aerospace industry-derived manufacturing and bonding techniques. With regard to vehicle dynamics, the Ferrari 458 Italia's suspension features twin wishbones at the front and a multi-link set-up at the rear tuned for maximum roadholding and superlative handling. Along with a more direct steering ratio, the 458 Italia thus offers extremely rapid turn-in and body control whilst maintaining superior ride comfort. The Ferrari 458 Italia's interior is another area of the car that exalts its sporty personality. The driver is welcomed by a new layout and a revolutionary ergonomic interface where the main controls are all clustered on the steering wheel.